We have talked about Red Box at Discount Movie Passes before. We told you about a new streaming service which is out to Kill Netflix. Also, we updated you that if you join Red Box you would get free rental codes and how this process works. Free Redbox rental codes Today we have complied the most recent codes to date for Free Redbox Rental codes that are good in 2013. This list is updated whenever we find new codes are any of our members alert us with new codes. Enjoy some Free Rentals at Redbox with these codes. Here are all the latest Redbox codes for FREE rentals or discounted rentals when you use the codes! Remember movies have to be returned by 9pm to avoid extra day rental charges. They can be returned at ANY Kiosk, you don’t have to return to the one you rented at, WAY COOL! Each Redbox code can only be used once per credit card. Some Redbox promo codes may be regional and not work everywhere. Let us know what Redbox codes you find and what is working / not working! Also most codes only work at the kiosk at this time. They don’t give many that can be entered online. You can reserve the movie online and use the code when you go pick it up though! 1) Use Redbox code: Q5K72X4Z to get $.50 off a second disc. These promo codes can be used when reserving online! Good through March 16th only. 2) New FREE Redbox Game code! Text the keyword GAMEKIDS to 727272 and you will get the code for a FREE game rental. A unique, one use code is sent right back to you via text message. This keyword should be good through March, 2013. 3) New user to Redbox or creating a new account? Then register at the Redbox site and receive a FREE code for your next rental! Some more codes that I usually access while on my smartphone at the Redbox Kiosk. The easiest way to rent is to reserve your movies online first at Redbox.com. Then just go to the kiosk and hit the Pick Up Online Reservation button and slide your card. Nice! Convenient. 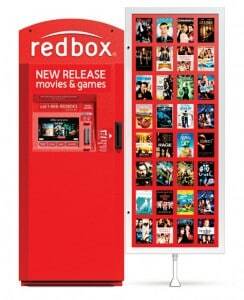 The Redbox network extends nationwide with more than 34,600 locations. Redbox kiosks are located where consumers already shop – leading grocery stores, mass merchant retailers, drugstores, restaurants and convenience stores nationwide. Easy. Redbox’s convenient rent-and-return anywhere® policy and simple touch screen rental process makes movie and game renting easy. To ensure a title of choice is there for pick up, consumers also can reserve a movie or game online or via the Redbox iPhone® or Android™ mobile apps. To learn more about the rental and return process at Redbox, visit The Redbox Rental Process or to find the nearest Redbox location, visit www.redbox.com or text ‘FIND’ to 727272. Up to 2 messages a week. Message & data rates may apply. Text STOP to quit, HELP for help. Only available on participating carriers. Affordable. Top new release movies are available to rent at an affordable price. Video games are available to rent for as low as $2 a day. Fun. Redbox features the latest release movies and games, with a selection of the most popular titles and family favorites. Not sure what to rent? Visit redbox.com/movies or redbox.com/games to see what’s new or mobile users can text ‘NEW’ to 727272. Up to 2 messages a week. Message & data rates may apply. Text STOP to quit, HELP for help. Only available on participating carriers.